The Hulk’s world is changing with each passing issue of The Immortal Hulk, but #12, written by Al Ewing, with pencils by Joe Bennett and Eric Nguyen, inks by Ruy Jose (and Nguyen again), and colors by Paul Mounts, brings the biggest changes yet. Previously, Absorbing Man was tricked into absorbing Hulk’s gamma energy, opening the “Green Door” to what is essentially Hell. Now, Banner has been split from his monstrous alter ego, leaving the Green Goliath to wander Hell with reporter Jackie McGee. Ewing finally shines the spotlight on Banner’s father, who was revealed issues ago to be manipulating Hulk from beyond the grave on behalf of a mysterious, dark entity. Now that he’s managed to manipulate the land of the living into opening the “Green Door” to Hell, he’s spending his time explaining himself to his son (who may, or may not, be able to hear him). Ewing masterfully weaves his dark tale of an evil entity manipulating Banner, the Hulk, and his father, altering the history of old Jade Jaws for all time. Whether these retcons truly stand the test of years to come is unknown at the moment, but Ewing is doing his best to make sure we’ll be talking about them for the foreseeable future. If every great comic book writer adds something of his/her own to a story in their run on a title, then Ewing is doing the work of several writers. 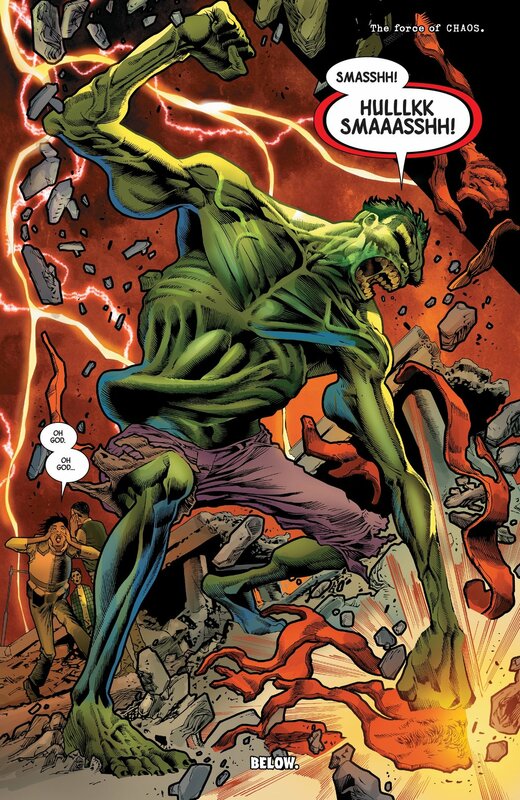 In every chapter of The Immortal Hulk, Ewing seems to add some new wrinkle to the character, whether it’s as small as a personality tick, or as large as a whole new identity for the Hulk. This issue is no different. The very nature of Hulk and Bruce, and their relationship to one another, is being called into question, and it’s unlikely Ewing will leave this book without making the readers redefine how they think of the character. Is he a misunderstood monster, created by an accident of science, or is there something more sinister to that accident, and the creature that was born from it? Ewing will, no doubt, keep people guessing for some time, but the journey to the answers is one hell of a ride. Bennett, once again, proves he was born to draw this book, but he’s joined this issue by another talented penciler/inker, Nguyen, who handles all of the art duties, except colors, on the flashback portions. Nguyen’s pencils and inks work well with the dark subject matter in his parts of the book, and add a very welcome creepiness to Banner’s father’s memories. Jose, who inks the rest of the book, as well as Mounts on colors, work their usual magic, elevating this title into one of the best Marvel has to offer, art-wise. If you’re not reading this book, you are doing yourself a disservice. Even if you’ve never been a big fan of the Hulk, give it a try. Ewing is crafting a story that is somehow, everything a classic Hulk fan would love, while still being completely different than anything that’s come before it. This will be a beloved piece of Hulk history years from now, if there’s any justice in the world. Jump aboard now, while history is still being made.